We’ve entered a new era. Call it the age of imagination, ideation, conceptualization, creativity, innovation—take your pick. Creativity, mental flexibility, and collaboration have displaced one-dimensional intelligence and isolated determination as core ingredients of competitive advantage. But these 21st century methods and mindsets needed to drive innovation are only found by tapping into the discretionary levels of passion and initiative within us. This is where Out Think leadership comes in. Out Think presents big ideas along with actionable advice to drive unique value and innovation in today’s chaotic marketplace. In each chapter a key idea, behavior, or mindset shift is discussed. The shift is illustrated through proprietary interviews with business leaders conducted by the author. Techniques are described to show how the shift or idea can be implemented, with real-world examples. Assessments, exercises, and actionable messaging are highlighted throughout the book. 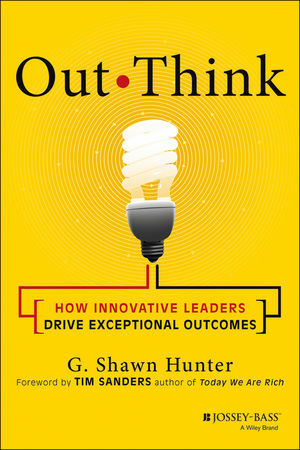 While some books address the changing economic landscape and the challenges of the creative age, Out Think is unique in the author’s unparalleled access, spanning more than a decade, to executives and thought-leaders who are, in fact, making a measurable difference. Through interviews and collaboration with these individuals, Hunter has assembled insights, stories, and actionable take-aways, with an emphasis on results that can drive the change that leaders want and need in their organizations. G. Shawn Hunter (Portland, Maine) is Executive Producer for Skillsoft's video learning products. In developing these products, Hunter has collaborated with and interviewed hundreds of executives, thought-leaders, academics and authors in the U.S., Canada, the U.K., Europe and Australia. These interviews have been transcribed, tagged and published in Skillsoft's Leadership Development Channel and 50 Lessons products. Shawn co-founded Targeted Learning Corporation with his father, Hal Hunter, Ph.D., which was acquired by Skillsoft in 2007. Prior to founding TLC, Shawn worked a ski instructor, on a ranch in Montana, an English teacher abroad, and bicycled across much of America. Skillsoft is a pioneer in the field of learning with a long history of innovation. Skillsoft provides cloud-based learning solutions for our customers worldwide, who range from global enterprises, government and education customers to mid-sized and small businesses. Skillsoft serves over 5,000 customers and more than 13 million learners worldwide and provide continuing, hands-on support to assist them in maximizing their ongoing success.